2. Adjust the grips. Touch the silver OD Logo to get a menu. Chose ADJUST. HandPos. 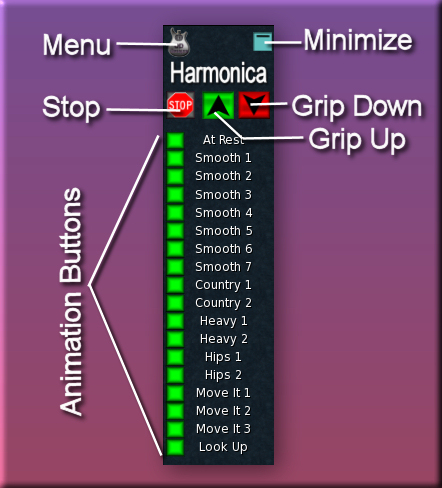 The position of hands when playing the harmonica. There are many different options for hand position. Chooose one that is the right height and hand spacing for your avatar. HeadPos. The position of head when playing the harmonica. There are a few different options. Make sure the hands are in the "up" position, then chooose one that is right for your avatar. HoldPos. The position of hands when holding the harmonica but not playing. This is the "grip down" position. There are a few different options. Chooose one that is the right hand spacing for your avatar.